What Kind of Fishing Boat is That? Purse seiners catch salmon (primarily pink salmon) and herring by encircling them with a long net and drawing (pursing) the bottom closed to capture the fish. The net is first stacked on the stern of the boat and then paid into the water while the boat travels in a large circle around the fish. 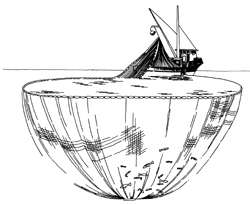 The far end of the net is attached to a power skiff, which helps the operation by holding the net while the seiner completes the circle. The top of the net stays on the surface of the water because of its “float line,” which runs through thousands of colorful floats. The bottom of the net falls vertically because of its weighted “lead line.” As a result, the net hangs like a curtain around the school of fish. The vessel crew then purses its bottom with a “purse line.” The lines, and thus the net, are retrieved through a hydraulic power block (winch). Once most of the net has been retrieved, with the remainder of it lying in a “bag” alongside the vessel, the fish are dipped from the bag and into the vessel’s hold. For large catches of herring, a buying vessel or “tender” comes alongside the fishing vessel and lowers the end of a fish pump into the bagged purse seine. The herring are then pumped aboard the tender and into its hold without ever going aboard the seiner. Sometimes referred to as “limit seiners,” purse seiners are sleek, cabin-forward vessels that are limited by Alaska law to 58 feet in length in order to more precisely manage their fishing effort. They are recognized by their long, clean decks, the boom with its power block, the net stacked on the back, and the power skiff that is often seen riding “piggyback” aboard the vessel’s stern while it is traveling. When fishing, the circle of floats on the surface of the water and the power skiff assisting with the operation are sure giveaways. Seine-caught salmon are delivered “in-the-round” (whole) to buying stations and canneries where they end up as canned and frozen products. Herring are delivered to processing plants where they are either stripped of their roe (eggs), or packaged as bait for other commercial fisheries; e.g., the longline fisheries and the crab fisheries. Salted herring roe, called “kazunoko,” is shipped to Japan where it is a high-priced delicacy. Crabbers target Dungeness, king, and Tanner crabs using twine or wire-mesh steel pots (traps). Baited with herring or other fresh bait, the pots are left to “soak” for several days. A line extends from each pot to a surface buoy that marks its location. There are several configurations for the pots, though in general, the smaller round pots are fished for Dungeness in shallow bays and estuaries, and the large, heavy, rectangular pots are fished in waters deeper than 100 feet for king and Tanner crab. A power winch is used to retrieve the pots. Once aboard, a pot is opened and the catch sorted. Females and undersized males are discarded (alive) over the side and legal-sized males are retained in aerated seawater tanks. Crab boats come in a variety of shapes and sizes, from aluminum skiffs with outboard motors that fish the inside waters for Dungeness, to seagoing vessels of 100 feet or more that ply the Bering Sea and the Gulf of Alaska for king crab. Unless one happens to see a crabber headed for the fishing grounds with its decks stacked with pots, identification of a vessel as a crabber might be difficult for the casual observer. Crabs are delivered live to shore stations where they are cooked and then either canned or sold as a fresh or frozen product. A small number are sold live in local markets through retail outlets that have circulating seawater holding tanks. Troll vessels catch salmon, principally chinook, coho, and pink salmon, by “trolling” bait or lures through feeding concentrations of fish. The word “troll” comes from a medieval German word, “trollen,” and refers to the revolving motion of the bait or lures used in this type of fishing. 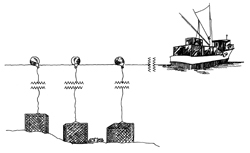 Typically, four to six main wire lines are fished, each of which has a large (40 lb), lead or iron sinker (“cannon ball”) on its terminal end, and 8 to12 nylon leaders spaced out along its length, each of which ends in either a lure or baited hook. 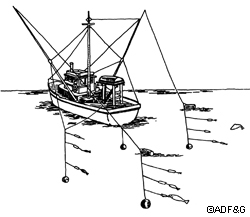 To retrieve hooked fish, the main lines are wound about small, onboard spools via hand crank (hand trollers) or with hydraulic power (power trollers), and the fish are gaffed when alongside the vessel. The leaders are then rebaited and let back down to the desired depth(s). Troll vessels come in a variety of sizes and configurations, ranging from small, hand troll skiffs to large, ocean-going power troll vessels of 50 feet or more in length. Troll salmon fishermen operate throughout Southeast Alaska in both state and federal waters. The troll salmon fishery produces a low-volume, high-quality product. Troll-caught salmon are dressed at sea and sold either as a fresh or frozen product. Public markets and fine restaurants are the final destination.